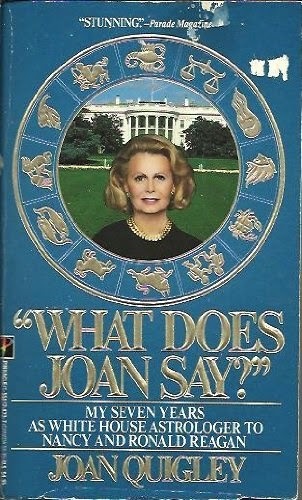 Joan Quigley, an astrologer who advised Nancy Reagan, died recently. While Quigley played a big role in scheduling and made MichaelDeaver’s life difficult, she didn’t have any policy influence. Still, for some this was taken as the absolute epitome of the ludicrousness of the Reagan presidency. But perhaps something deeper and more interesting was going. Nancy was perhaps that rarity, a disinterested advisor. …her husband’s closest associates, however valuable or liked or even loved, were to be sacrificed, in her view, from the moment their continuation on the scene could compromise the President’s public relation. In concern for his physical safety, she did something Regan (out of office) characterized as silly: consulting an astrologer about her man’s engagements where the White House had discretion in setting of a date-silly, to be sure, though possibly no more so than the whims of staff, or press, or partisans, or family quite traditional in such decisions. We imagine President’s being in control, but in many ways they are as subject to the whims of fate as anyone. A combination of duty and other people’s schedules drive their day. Nancy Reagan adored her husband and was terrified that he might be assassinated. What could she do? Did consulting an astrologer and manipulating dates give her a sense of control, which in turn brought a modest peace of mind – allowing her to help her husband? Maybe. Is it terrible that Nancy Reagan turned to astrology, which of course has no credible scientific basis? I don’t see why? Reason rejects astrology, but reason offered Nancy Reagan no comfort about her husband’s safety. Could security experts have briefed her and tried to convince her he would be safe? Sure, but why should she believe them since an assassin got through once before? Maybe she could have had a doctor subscribe some anti-anxiety medication, it would have been cheaper (Quigley was paid $3000 monthly) but would it have had a better result? Astrology and its many cousins fill a need. We can decry this as superstition, but is that completely fair? Certainly there are people taken in by hucksters – but it is tough to believe such people won’t find some other way to bankrupt themselves. For others, who spend a little money on occasion, it does little harm and may even do some good. But where else can you get, on demand, hopeful, inspiring projections for the real future. Where else, on a windy day in January, can you drive out beset by blue devils and in five minutes be semi-reliably assured by a relative stranger that you are who you think you are, and that things aren’t going to turn out so crappy after all? Science is a tremendous, awesome thing, grounded on hard findings that have been rigorously tested. It has made our lives safer and more comfortable in astounding, endless ways. But sometimes it does not provide the comfort we need. We may, in this age of “big data” be moving towards analytical understanding of the affairs of the heart. So be it. But understanding something emotionally painful may not be much help working through the emotional pain. Science may very well tell us that rationally we are tiny specks in a vast uncaring – but marvelous – universe. I personally am filled with wonder by much of it, but staring into infinity can be exhausting for all but the bravest. Sometimes, we crave small comforts and the assurance that infinitesimal speck we may be – there is some hope and purpose to us after all. I’ve told you already; it’s a way of channeling intuitions and things that can’t be reached by the broad, floodlit paths of science. You can’t nail it down, but I don’t think that’s a good enough reason for brushing it aside. You can’t talk to the Mothers [that character’s term for archetypes] by getting them on the phone, you know. They have an unlisted number.